You can gain an impression about our activities from the following examples of earlier developments. With some of the shown developments customised and extended modules or devices can be created from them (rapid prototyping). 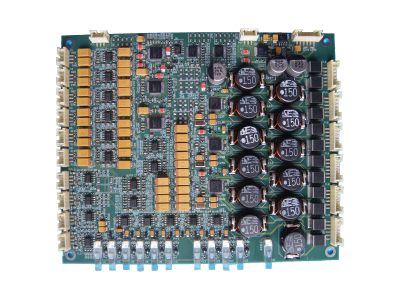 Audio DSP system for a multi-channel loudspeaker. With 6 analog inputs and 6 class-D power amplifiers, the system provides the basis for an active multi-channel loudspeaker. Furthermore, the unit offers 4 analog outputs, peak indicators and an external mute function. Datalogger for EnDat 2.2 systems. The FPGA is, as a highly integrated logic element, part of a PCI card, which also includes a microcontroller. Its configuration includes the complete logic circuitry of the synchronous serial data interface EnDat 2.2 (8 MHz). All data on the EnDat line are received by the FPGA, evaluated and passed on through a register interface to the microcontroller. Device for generating alternating magnetic fields for medical treatment. The device has a microcontroller management, an HMI with touchscreen and graphic display and a patent-pending transconductance amplifier.